Improving the branch experience through visual communication. With competition between banks at an all-time high, financial institutions must find ways to enhance the customer experience within the branch. Through strategically placed interactive digital signage, banks can capture customer’s attention, reduce perceived wait times and improve overall brand perception. Branches can deliver real time localized messaging and generate new revenue by up-selling and promoting new products and services. Digital signage can also improve communication with employees and bank representatives and enhance customer service with mobile engagement and free standing kiosks. 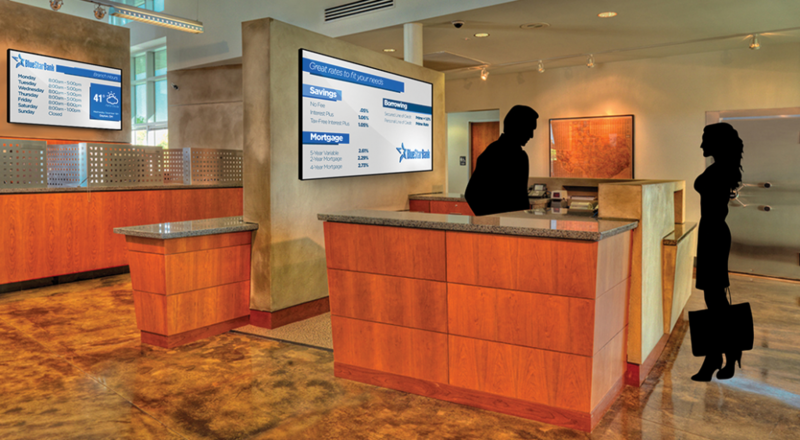 By integrating digital signage into your in-branch marketing and communications program, your branch and the customers you serve will be delighted with the outcome. Improve time-to-market for announcements, rate changes, etc. As traditional advertising becomes less effective, digital signage is shedding new light on promotional strategies and communication methods. Enhance the shopper experience with interactive digital screens in any shape and size to display products or promotions in your store. Strategic visual merchandising builds awareness, increases your competitive advantage, strengthens customer relationships all while driving sales. Whether used for informational messaging, advertising, entertainment or architectural ambiance, these digital signage displays can transform the experiences of shopping, working and socializing. Reduce wait times and improve customer service through deployment of self-service kiosks. Strategically placed throughout the branch, routine transactional banking activities can be completed through a touch of a button. Modern banking extends beyond the in-branch experience to the digital world by connecting to customers in new ways. Our mobile engagement solutions provide sophisticated consumer interaction through the use of Mobile Applications, SMS, Point-of-Sale, email, in-branch Wi-Fi and beacons. Branches can engage in one on one interactions with consumers and increase upsell opportunities by connecting with consumers before, during and after the bank visit. Grab your audience’s attention with impressive, ultra-thin floor stand or window frame mounted digital signage. With dual sided displays, branches can impact customers inside and out. With 4K Video Walls, banks and financial institutions can captivate consumers with richer more powerful digitally branded experiences. With no limitations on shape or size, branches can create maximum visual impact using dynamic or gestural walls that allow for a more compelling experience. Keep staff up to date with promotions, rates and industry regulations using STRATACACHE digital signage hardware, software and IP Video. STRATACACHE helps branches communicate product training to employees or share CEO spotlights and special events with customers using interactive distance learning or live and on-demand video. Effectively align messaging and engage employees by delivering an effective internal communications platform.